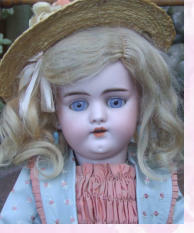 She has a perfect nice quality bisque head with lovely colouring, open close paperweight eyes with all eye wax intact, pierced ears, card pate and original mohair wig. The body is in good condition and looks like a Jumeau one apart from the hands which might have had a little work on them but look fine. She measures 18 inches and dates around 1910.